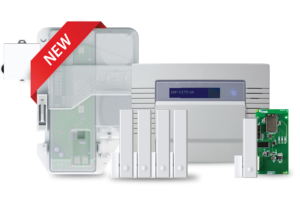 New for the UK and Republic of Ireland security markets, the Pyronix Enforcer Perimeter Protection Kit ensures that intruders are detected before they gain access to residential or small commercial properties. Featuring secure Enforcer two-way wireless technology and a combination of shock sensors and magnetic contacts, the Enforcer Perimeter Protection Kit provides an effective, alternative solution to internal, volumetric motion detection. Installer convenience– an all-in-one, great value kit that’s ready for installation; easy to handle and quick to install. Wireless solution– possesses advantages over wired solutions; faster and easier to fit with minimal disruption. Easy ordering– all that the security professional needs in one pack; no individual product ordering to construct the equivalent system.